In this course, you will learn about the OWASP Top 10 Proactive Controls document and the many guidelines it provides to help developers write better and more secure code. In particular, I provide an overview of the Proactive Controls and then I cover the first five security controls. These security controls include testing for security early and often, learning about parameterizing SQL queries, encoding data input that may be parsed as executable code, validating data input, and finally you will learn about identity and authentication techniques to make sure you know who is using your web applications. 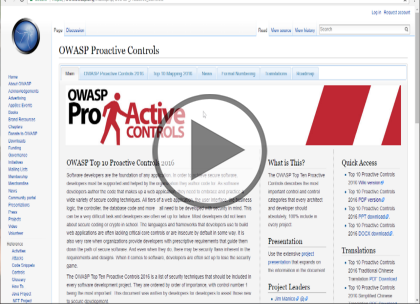 Join me in this course as we explore the OWASP Top 10 Proactive Controls. Robert Hurlbut is a software security architect and trainer. He is a Microsoft MVP for Developer Security / Visual Studio and Development Technologies and he holds the (ISC)2 CSSLP security certification. Robert has 30 years of industry experience in secure coding, software architecture, and software development and has served as a project manager, director of software development, chief software architect, and application security champion for several companies. He speaks at user groups, national and international conferences, and provides training for many clients.